I realized after I got dressed this morning, that everything I'm wearing is a knit. And I feel sooooo cozy and comfy as a result! I started today's outfit with the EF Dark Tulip skirt. This skirt borders on too short for my comfort level but paired with darker tights takes that discomfort out of the picture. I would not feel the same comfort with bare legs. 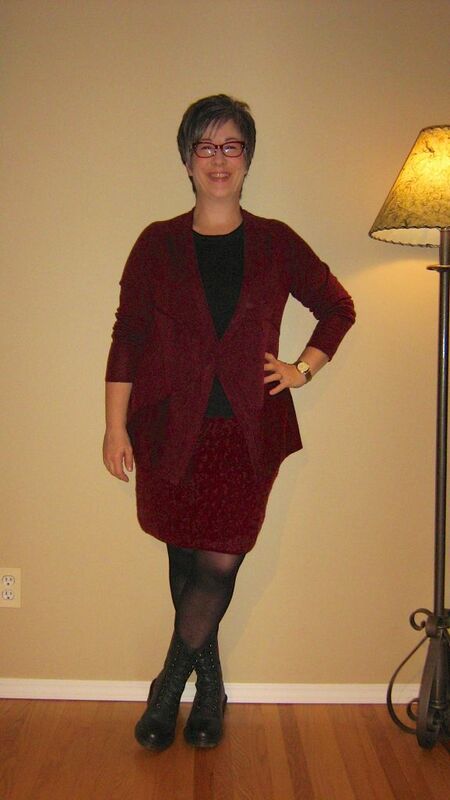 I then chose a knit black tank and then topped that with the Dark Tulip asymmetrical cardigan. To keep the leg line from being chopped up, I chose my black Docs for footwear. My black leather handbag and red specs, gold watch and wedding band finish off the outfit. I'm loving having accessories in cognac and have particularly enjoyed seeing Fabbers' outfits combining cognac and white (Diane - I'm looking at you :) ). So today's outfit started with my white slim BF jeans. 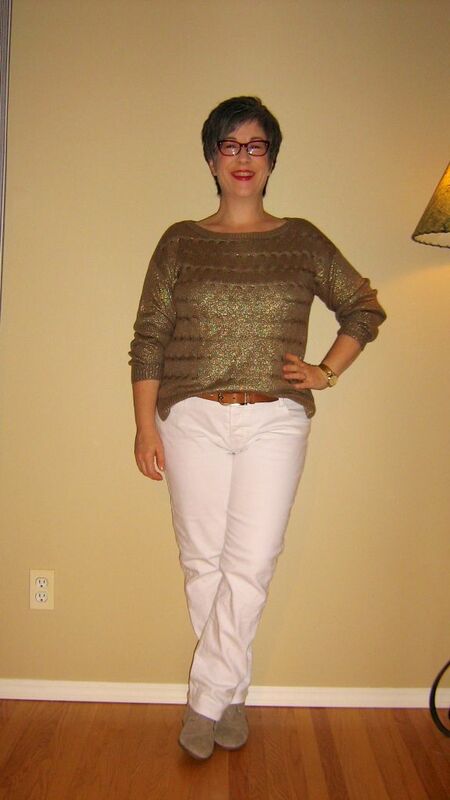 I then added my gold metallic knit pullover, semi tucked to show my new cognac belt. I love that the brass buckle of the belt matches the gold pullover. Unfortunately I don't have cognac booties - yet (I'm keeping my eye on the Clarks Chelsea boots in cognac like the black ones I have) so chose my sand suede wedge booties. For accessories I chose my cognac backpack, gold watch and wedding ring. So what are your thoughts on this outfit? Does it all work together? Would it be better with cognac booties? As always, all comments/suggestions welcome. There were a few comments in my outfit post this morning regarding my hair and it's longer length http://youlookfab.com/welookfa.....st-1391520. My stylist is away and normally I get my hair trimmed every 4-5 weeks but we're at 6 weeks now and I don't have an appointment until November 20th, which will make it 8 weeks before my trim. I wasn't able to get in with anyone else in the salon in my stylist's absence (they are booked solid) but I'm now kind of glad as I'm seeing what it looks like a little longer. And I'm surprised that I really really like it. I have fine hair but a lot of it - as my stylist has said, I will never go bald. The silver in it has given it more body than it used to have - my hair is fairly straight but has a few kinks here and there. As it's been growing, I'm liking the softness of it. Both in terms of how it softens my face, but also the actual texture of the hair - it feels nice when I touch it. Even hubby made a comment about that the other day. I've worn my hair very short for a while now, with varying degrees in style. I will never grow my hair long - it doesn't suit me and my narrow face - but I'm thinking of growing it out a bit more. I've added a couple of pics of what I'm thinking of working towards - sort of a hybrid between a shag and a pixie.I don't like fussing over my hair too much but don't mind having to give it a quick blow dry and flat iron in the morning. Anyway…on to the outfit…it started with my EF faux wrap jersey slouchy trousers (oh so comfy) and paired them with an EF silk tank in a grey tie-dye inspired print. 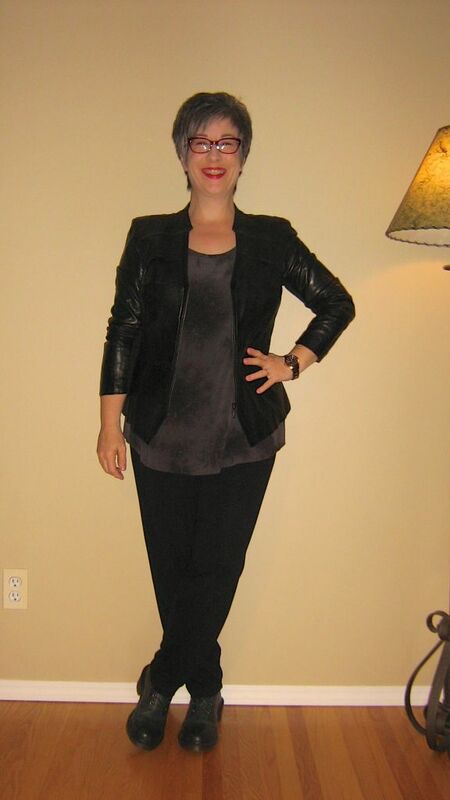 In order to give some structure to the fluid top and bottoms, I added my leather blazer (with scrunched sleeves). For footwear I went with my Doc Martens and chose my black leather w/gold hardware handbag. I finished off the outfit with my rose gold/black watch, gold wedding band, red specs and a swipe of red lipstick. So what do you think? Too dark and dreary or does it work because of the different textures and the "lightening" effect of the red specs/lip? As always, all comment/suggestions welcome.